Automating your business is all about saving time on routine tasks, so it's important to identify those tasks and learn how to automate them. Here at Voicent we've identified two areas in need of automated systems: sales and marketing. Voicent Sales Automation boosts agent performance by automating your company's sales processes at every point possible. With this powerful software, you can manage priority accounts, create workflow triggers, and turn leads into loyal customers. Voicent Marketing Automation is a powerful automated marketing service designed to fit all your business needs. It includes email dripping, website integration, built-in CRM, landing page tracking, and automatic reports. Voicent's business automation tools maximize lead awareness by integrating with our website to collect more data on our leads. It all starts with a simple web form where our leads fill out their information in order to receive updates on products, sales, etc. As you can see from the form, we collect a few important pieces of information. By knowing the contact's name, communications info, and industry, we're able to create a CRM record with enough information to know what products the lead might be interested in. 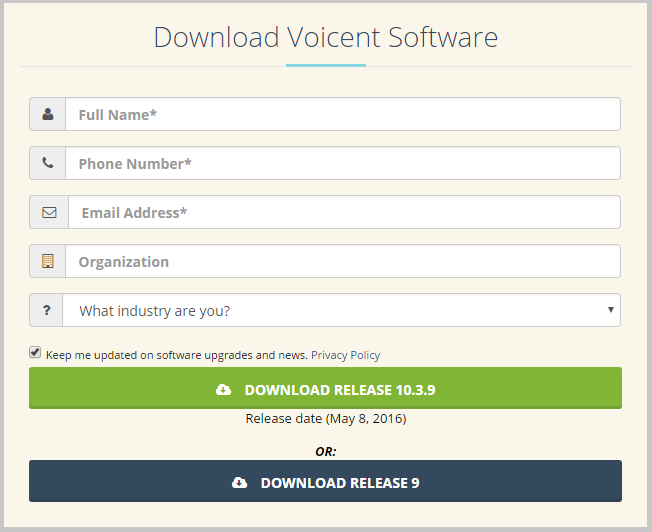 Once the CRM record is created, Voicent's Workflow Triggers get activated. The power of the Voicent platform is the automated omni-channel responses. In this example we utilize all three channels, sending an auto dialer message the same day they fill out the form, and then a text and email the day after. 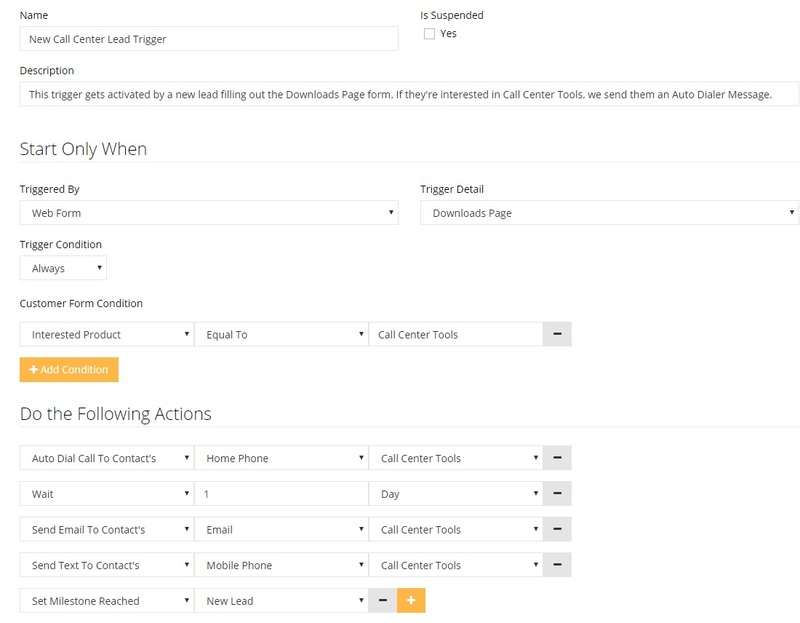 We set up a condition so that if the user specifies they are interested in Call Center Tools, we will send them an Auto Dialer message pertaining to call center tools. Triggers react to simple lead actions (filling out a web form). What's even more powerful is the Workflow Progress, a mechanism used to react to lead behaviors (acting interested in a product). For this example, we've got new leads that are signing up for a download of our shareware. This exhibits what we would call "new lead" behavior. In fact, filling out a "Contact Us" form could be considered "new lead" behavior as well. To account for this, all CRM records that come from these forms have their milestone set to "New Lead". 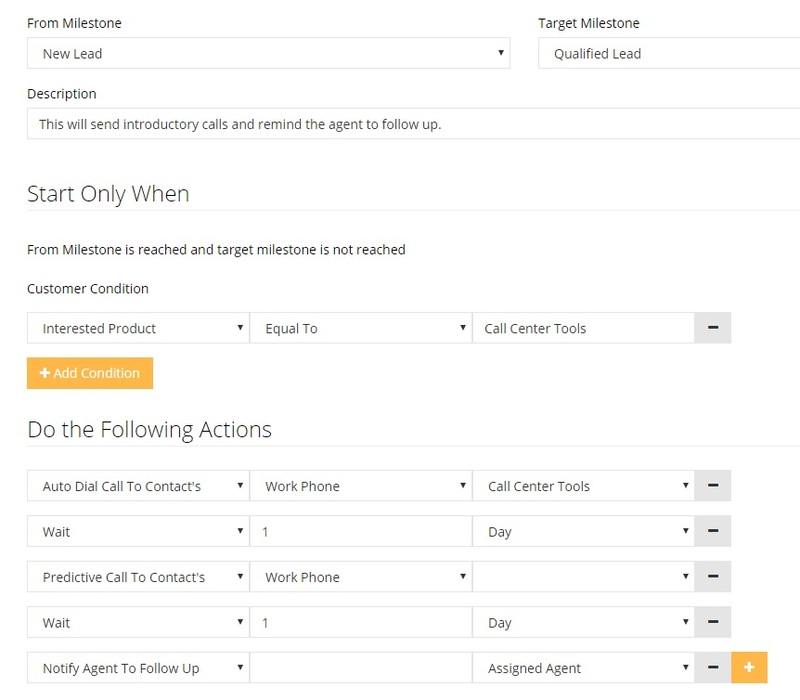 Now, those leads will be enrolled in the "New Lead | Qualified Lead" Workflow Progress, which starts with an auto dialer call, and then becomes a Predictive call with an Agent. After that, the agent will be notified of the fact that they need to follow up with the lead. An important thing to remember: we can set up forms, landing pages, and triggers to automatically transition the lead from milestone to milestone. Once you've done this, you have an automated way of transitioning your leads through the sales pipeline, and automated omni-channel messages every step of the way. We offer customized projects to meet your unique business needs. Whether you're tracking customers, implementing automatic sales pipeline progression, or just doing some conditional email dripping, we're here to help.